9:00PM on a Sunday. Most people are either scrambling to finish their homework, getting ready for the week ahead, or already in bed. Usually, those are the activities consuming my Sunday evenings as well – but not on Sunday, October 15. 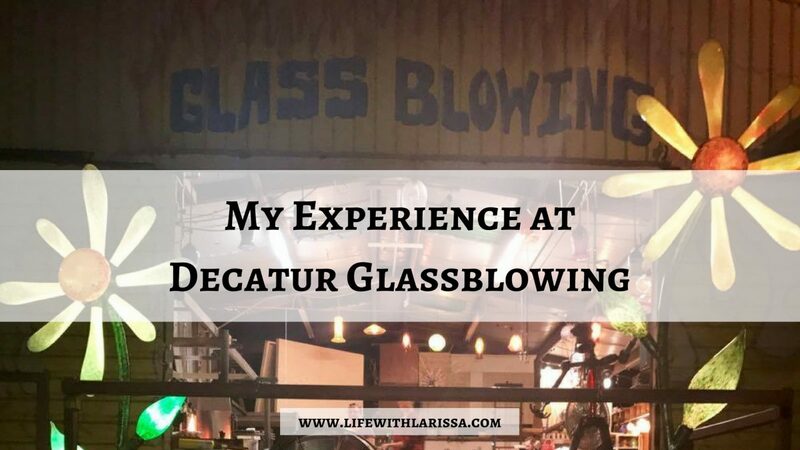 Instead, that night, I found myself at Decatur Glassblowing. 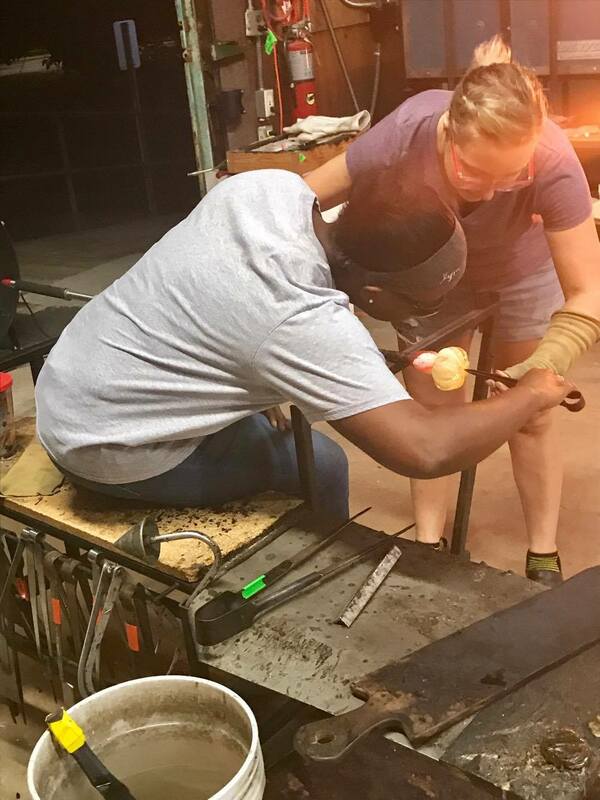 One of my friends invited me to go to a glassblowing class with him. I accepted because it was a new experience, and I was genuinely interested to see the process in action. To be honest though, when the time came, I wasn’t really that excited to go. I was tired and stressed, and then I became concerned about if I should have switched to my glasses instead of keeping my contacts in. Tip: They do ask that you arrive about 15 minutes early to ensure the class starts on time. 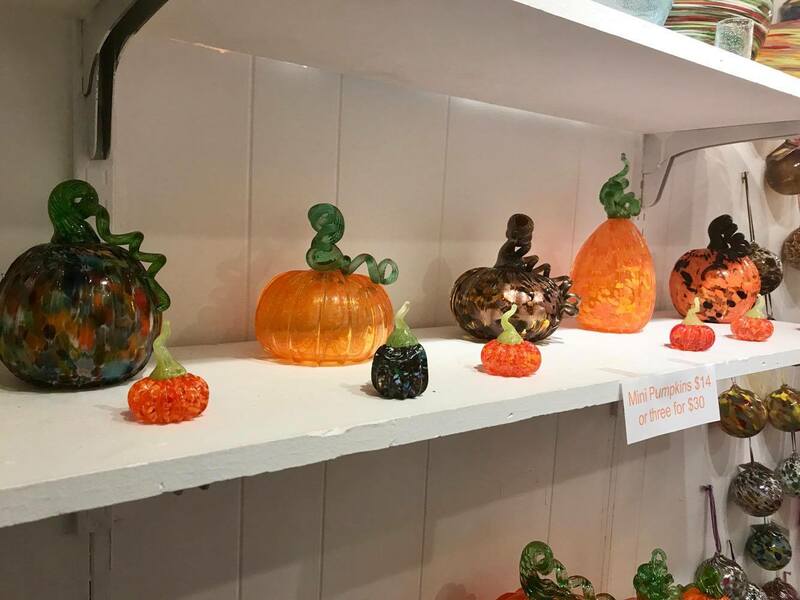 We plugged in the address to Decatur Glassblowing, and we made our way to the venue. I was a little unsure of the building at first, as it is down a small dark road. But my worries were alleviated when we got out of the car and walked into the gallery. 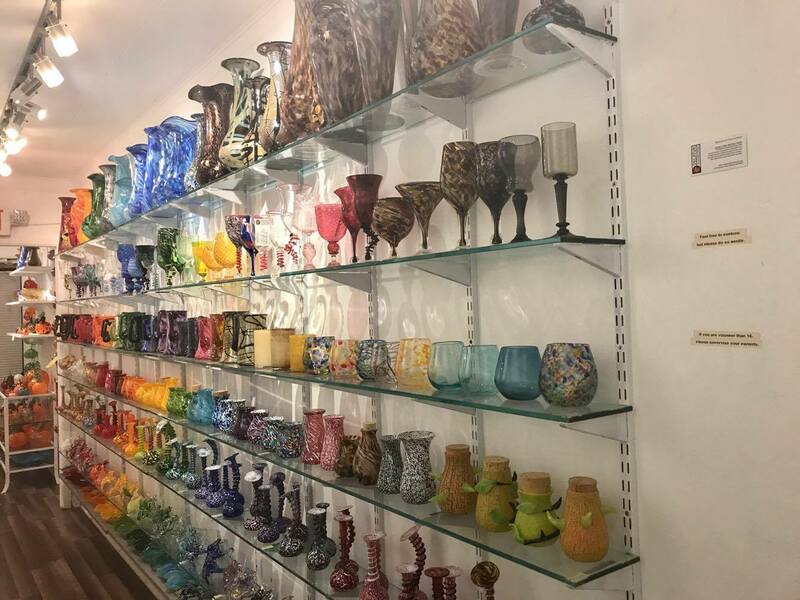 The inside was so light and bright, and filled with so many different glass trinkets. 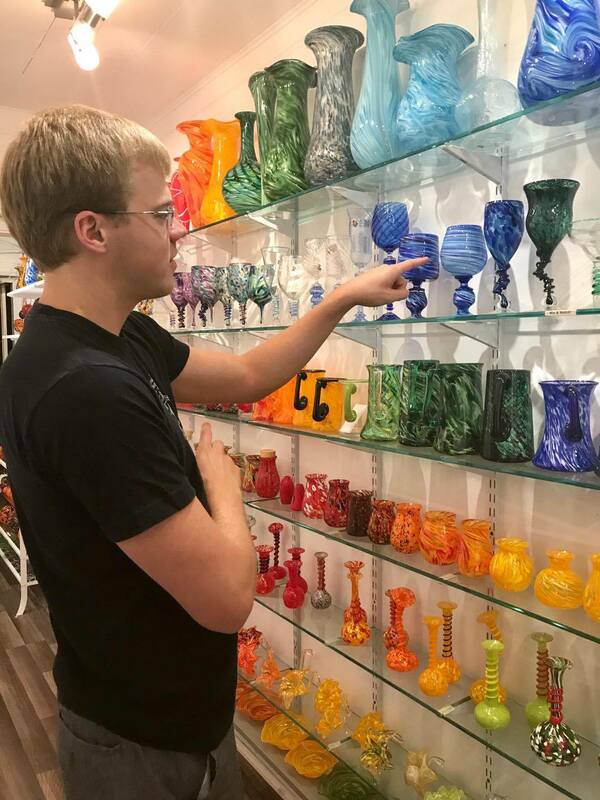 We checked in for our class at the front desk, and as we were early, we took that extra time to peruse the various glass collections displayed. There were pumpkins [what we were making in class that night], fruit, jellyfish, frogs, glasses/mugs, and so much more! 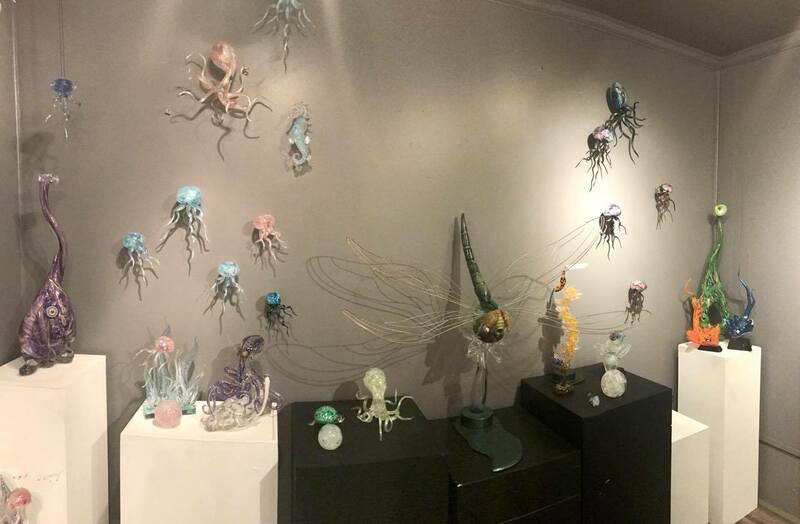 It was a little overwhelming to realize this was all made of glass, and I made sure to be extremely careful walking through the gallery. If you’re looking to get a gift for someone, this is the perfect place to do it. 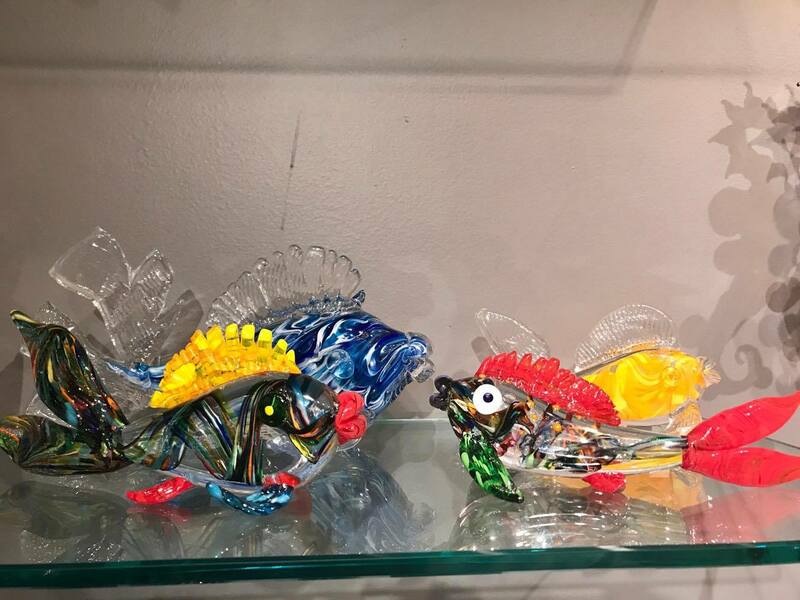 The various glass items lined on the walls and shelves were also on sale, and would make a great present for a birthday, a holiday [*ahem – Christmas/Hanukkah/Kwanzaa is coming up*], or just because you feel like giving a gift. Or you could just get something for yourself! There are so many different options – something for everyone! Shortly after browsing the gallery, we were called to begin our class. 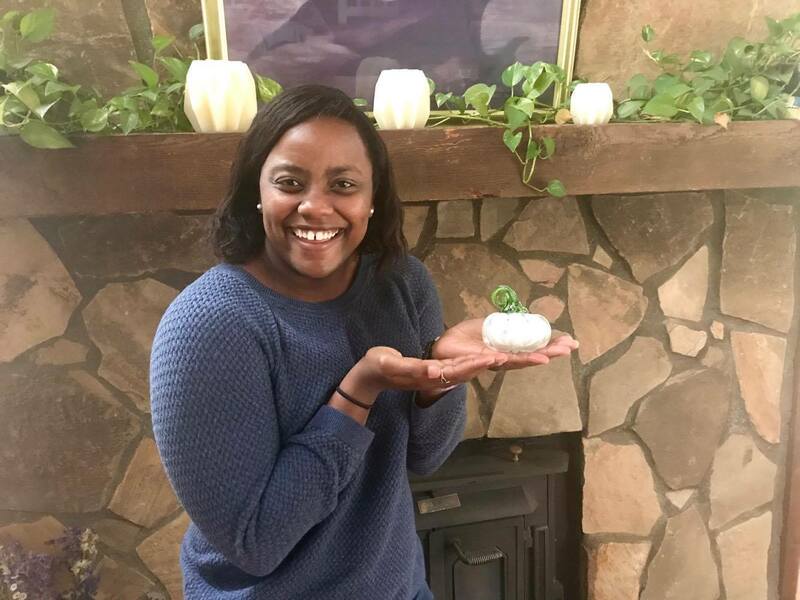 We sat down in chairs while one of our instructors took the time to explain the procedure to us, and made a pumpkin showing us each step in the process. Tip: You have to wear closed-toed shoes and protective eye wear to participate in the class. For the eye wear, you can use your own glasses, or they have glasses available. I had never done something like this before, so to say I was nervous would definitely be an understatement! 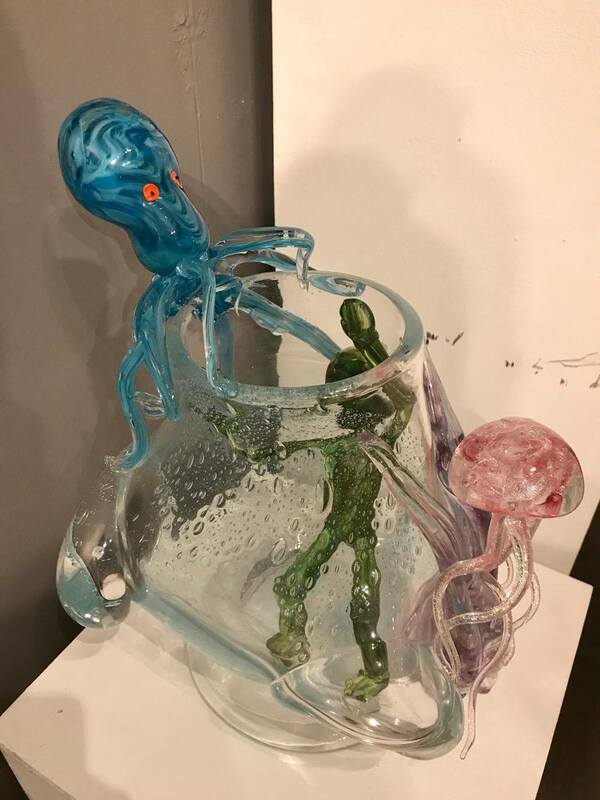 One of my greatest fears was dealing with the insane temperatures, or accidentally putting the molten glass somewhere it should not go. That ended up being a non-problem, as the instructors were so attentive and encouraging. 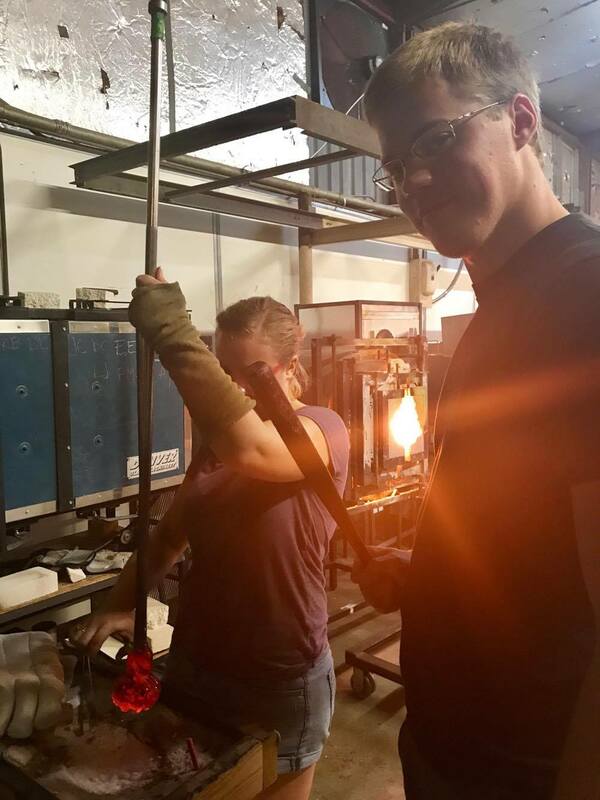 For the most part, they dealt with the super hot aspects of the glassblowing process, and if someone wasn’t comfortable doing a certain part, they didn’t mind helping out. 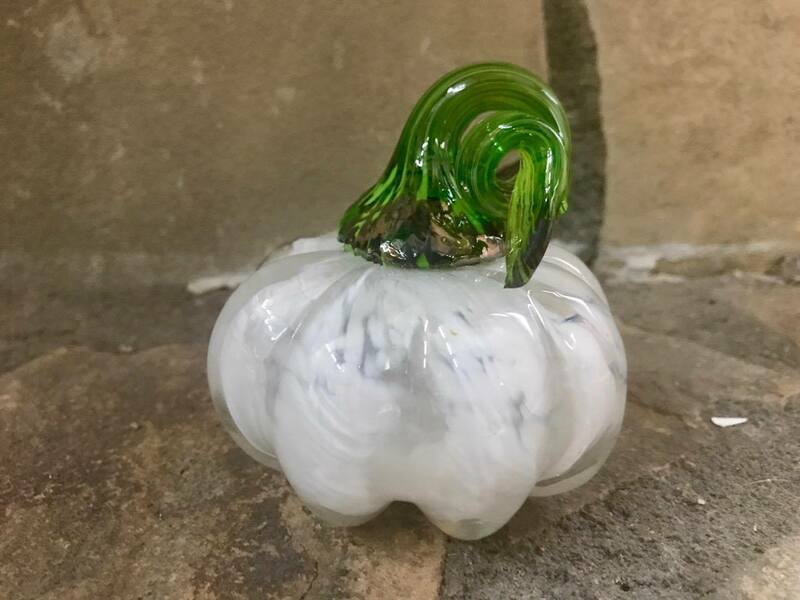 I present: my finished glass pumpkin! 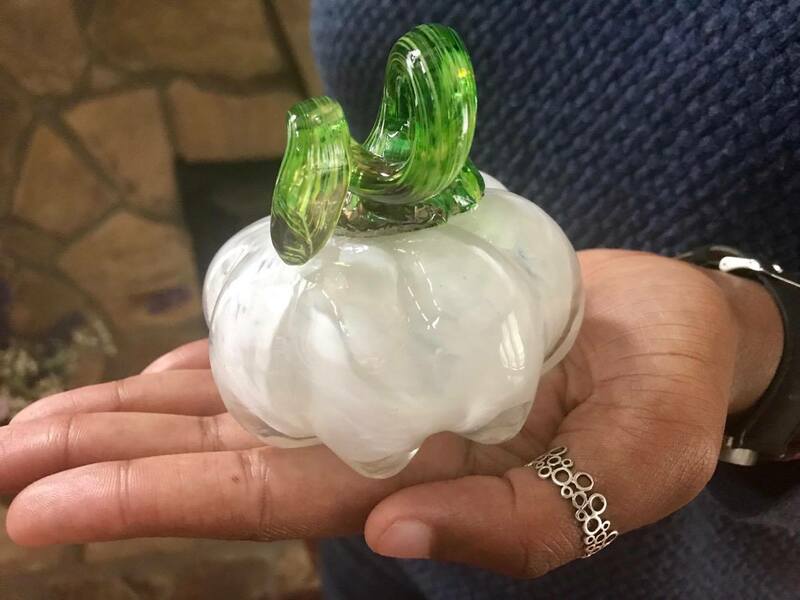 So happy with my glass pumpkin! I am beyond ecstatic with my pumpkin, and I’m actually surprised it turned out as well as it did! Just in time for Halloween too 🙂 I can also continue to use this cutie through the Thanksgiving season. And since I chose the colors white and green, I decided to start the trend of Christmas pumpkins. What of it? Hahaha…we’ll see how well that goes over. But all jokes aside – I am so happy I decided to take the class. I was so giddy by the end of the class, I was literally bouncing on the balls of my feet. 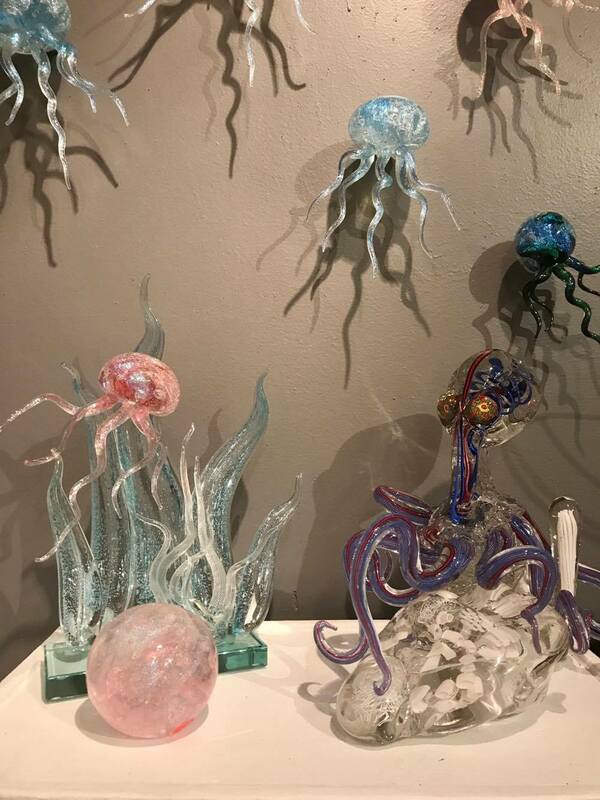 I can’t recommend Decatur Glassblowing enough. Everyone in our class had a blast, and the instructors are so patient, and so cool! 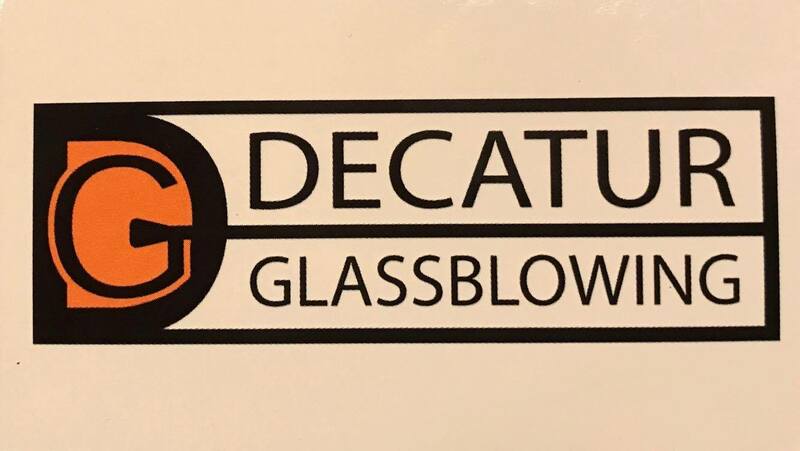 are you interested in booking a class with decatur glassblowing? Head over to their website and reserve your spot today! And if you book online by December 31, 2017 using the code LARISSA, you’ll receive 5% off any class! How exciting is that?! 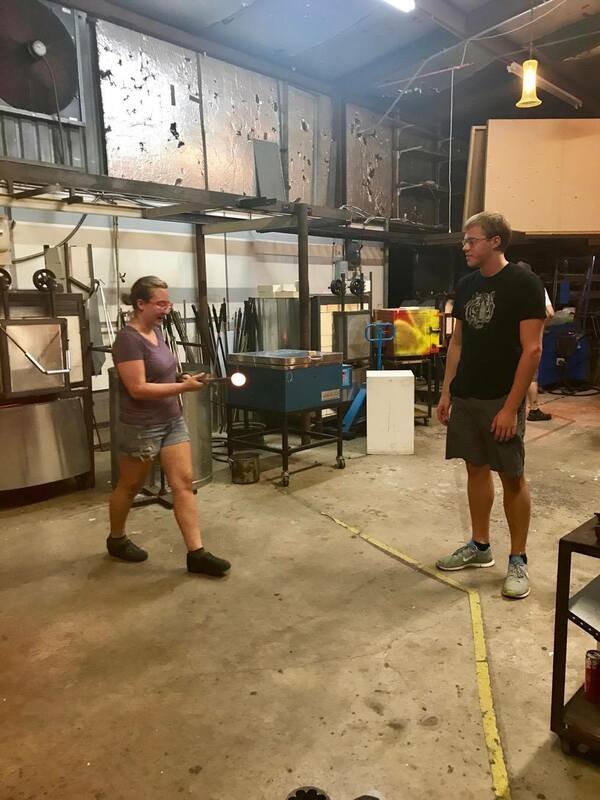 You have the option of a date night session, a group class, a private class, or a studio rental for more advanced glassblowers, and there are various days and time slots. Don’t worry! 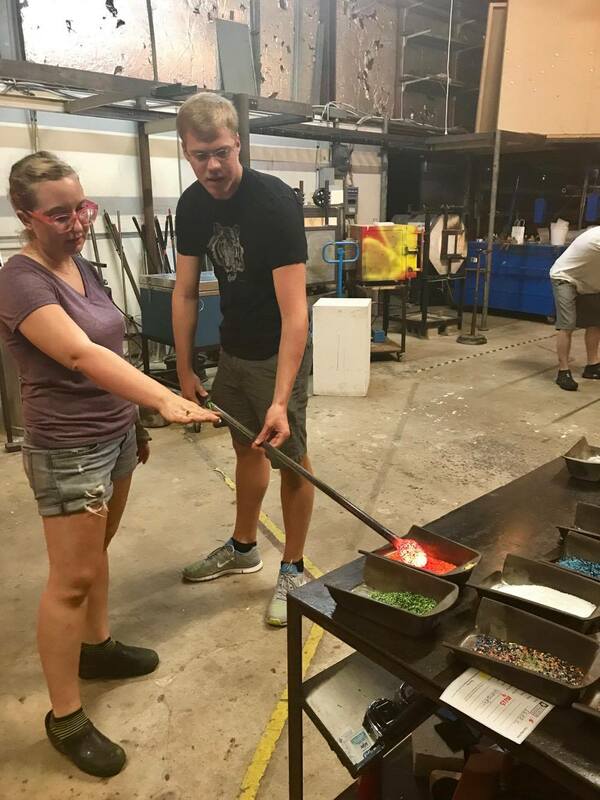 You don’t have to have any glassblowing experience [I had absolutely none and still had a blast!] – they will walk you through each step of the process! Oh ! I have always wanted to try this and reading this has been such an eye opener. I will have to look for this locally . 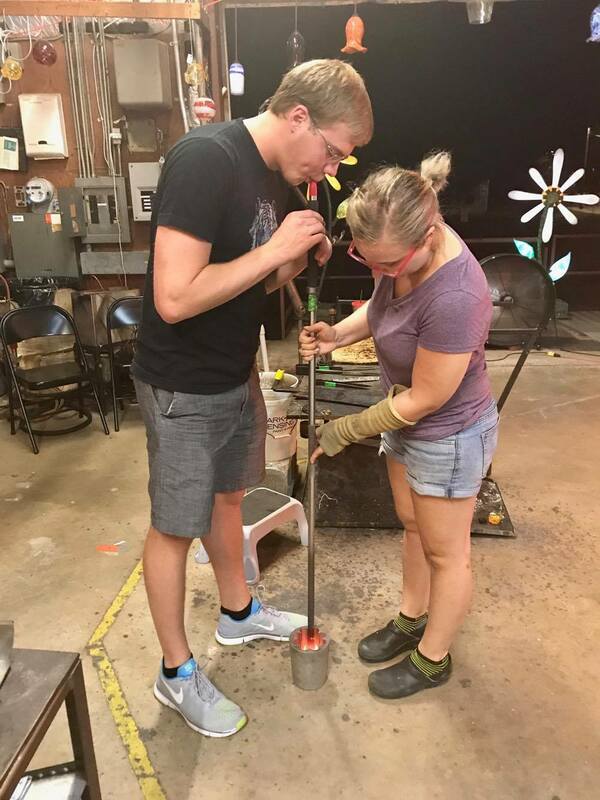 I’ve been wanting to try a glass blowing class ever since seeing the Chihuly exhibit in Seattle! It looks so fun! Your pumpkin turned out so cute! I’ve never seen a place like this but I always wanted to! 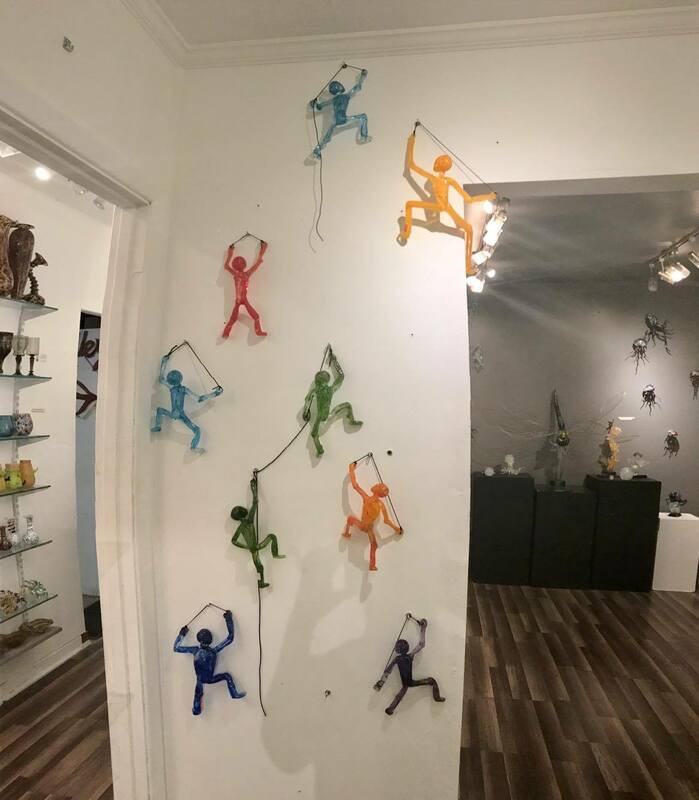 I think its so beautiful to see all the different colors and objects that can be made! How fun! You should go! 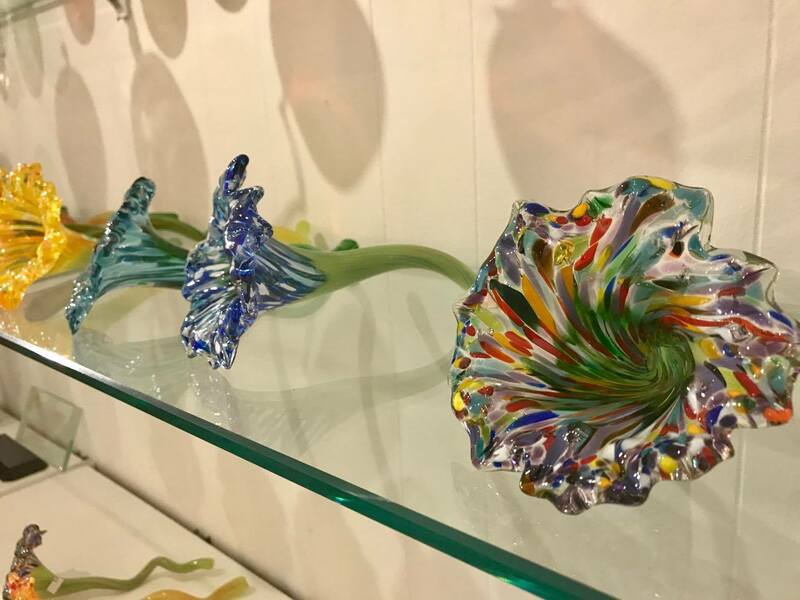 It was so neat to see the process, and of course making our own glass item was cool too! It turned out so well! 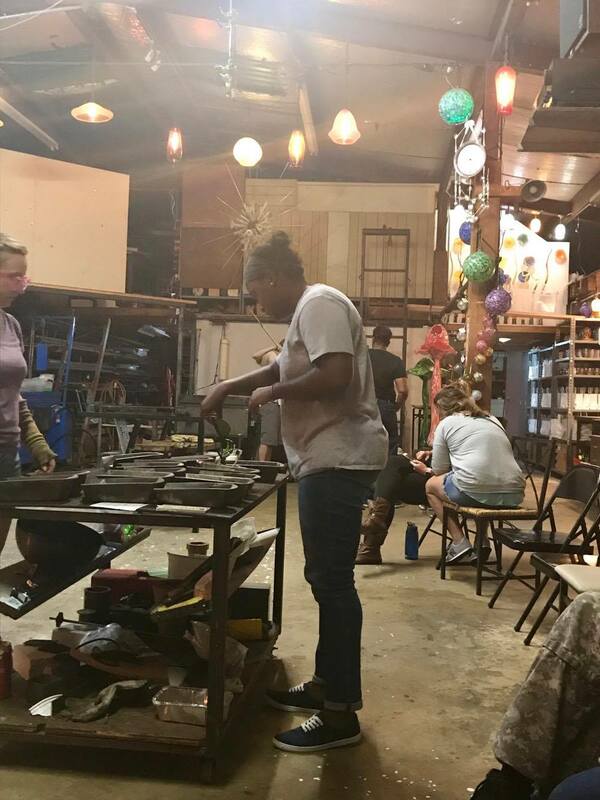 I’ve been glassblowing once and it was soooooo fun! Great reminder that I should look into doing it again. Makes a great date night! Wow this is so cool! Love your finished product too. I’m so impressed with your pumpkin! Love it! 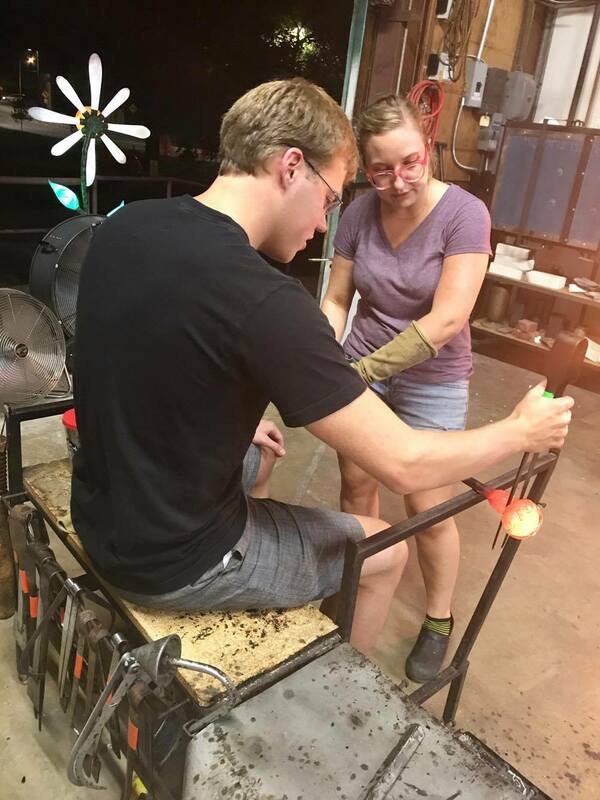 My brother did a glassblowing class, and I’ve been dying to try, too! Thanks for the great overview! Thank you! 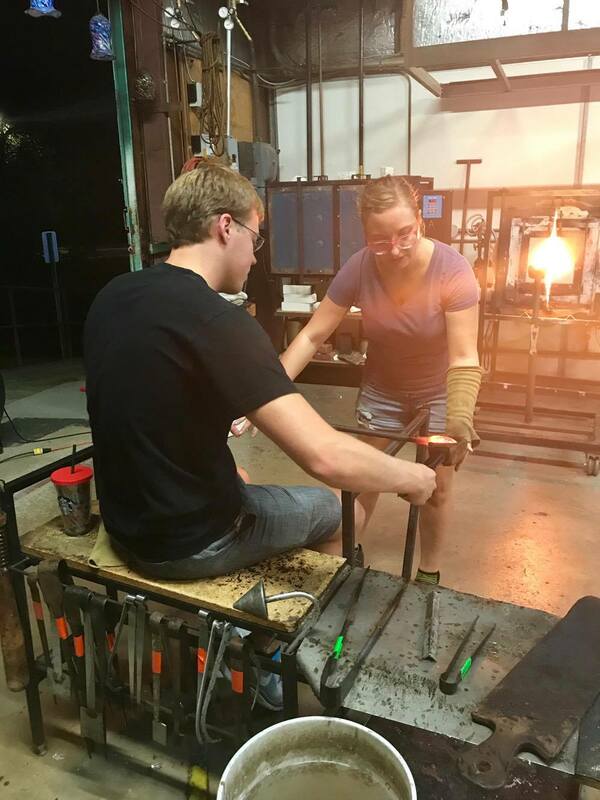 And yes, you should take a glassblowing class. It’s so neat! I have never considered doing one but now I want to. It would be so much fun. I highly recommend you try a class! You’ll have lots of fun! OMG this looks so fun! 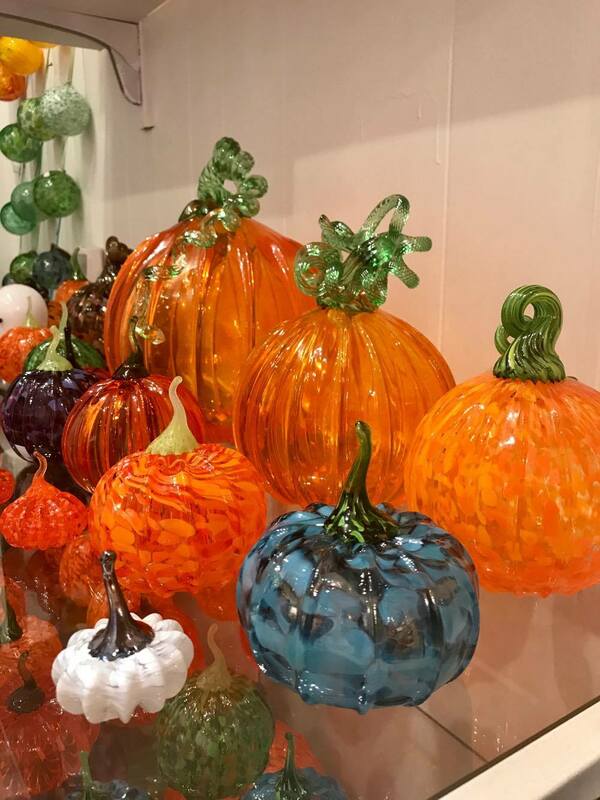 I have never done glassblowing before but I would love to try. Super cute pumpkin! Oh wow that’s really cool! You did great!! This is so cool!! 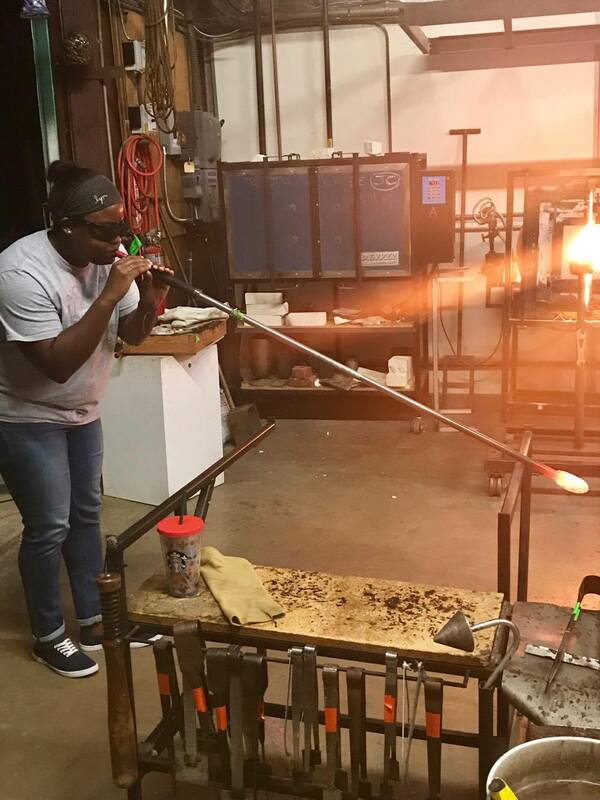 Watching glass blowing “blows” my mind. I would love to give it a try myself! Haha love the play on words! And you should definitely give it a go! 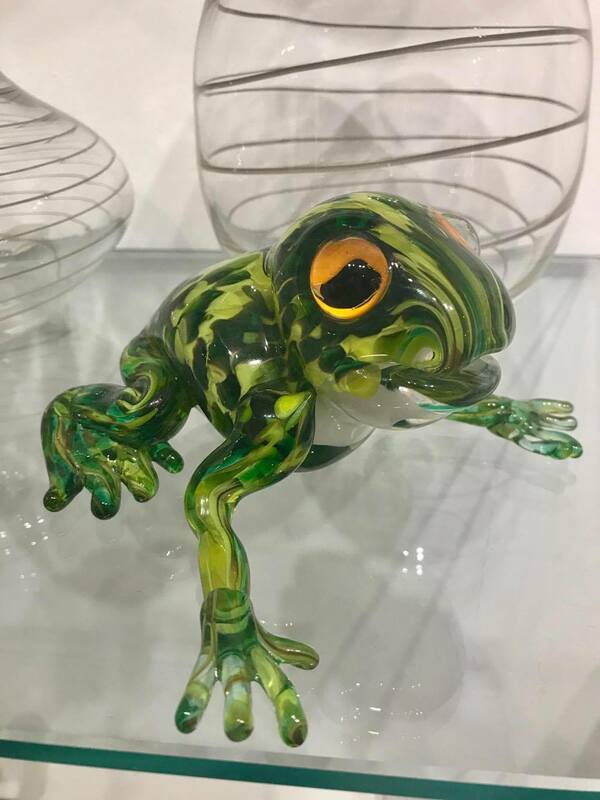 I’ve always been fascinated with videos of glass blowing- it’s such an impressive art form! I’d love to try it out for myself someday! It really is – and I feel like it’s also super under appreciated. It’s not as easy as it looks! I think that is so cool! 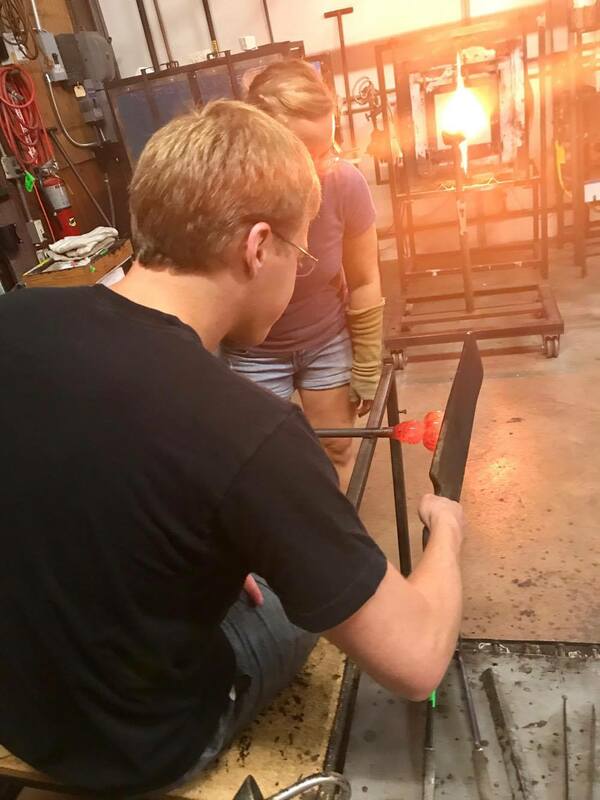 I had no idea there were classes you could make your own glass objects in. Reminds me of all the paint and plant night classes that are popular right now. I wonder if there are any classes like this in NY because I would love to try it! I didn’t know there were glasses like this either, until my friend invited me to go! And I’m sure you’ll find some in NY. If you take a class, you’ll have to let me know how it goes, and what you end up making! Haha I’m sucker for puns 🙂 and thank you so much! Your pumpkin looks beautiful! 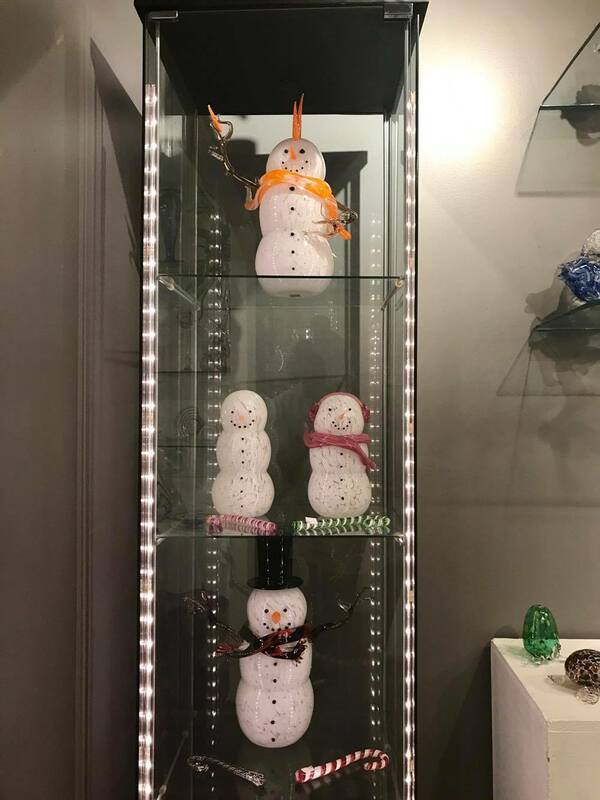 Also, the snowmen look adorable! 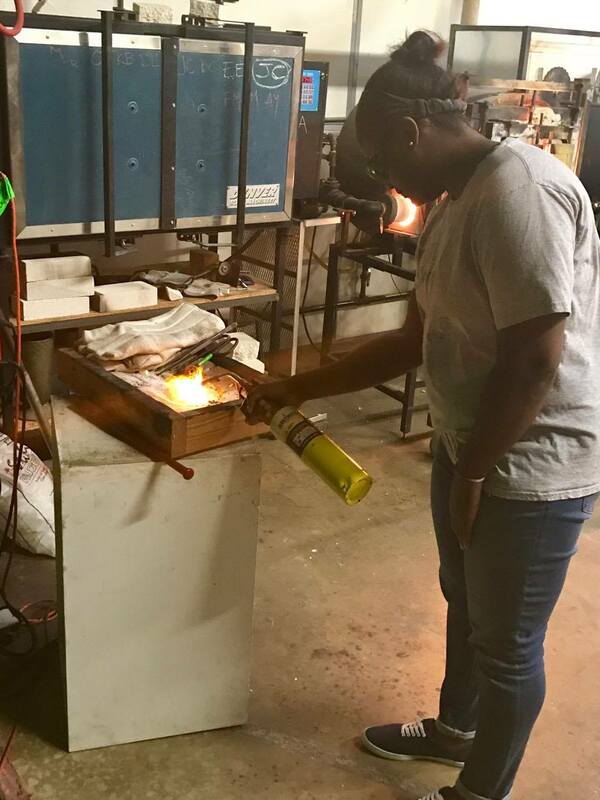 🙂 I loved learning about glassblowing. Interesting process. Can also be a metaphor for how we grow in life. Thank you Patricia! And wow…I never thought it that way, but yes for sure! 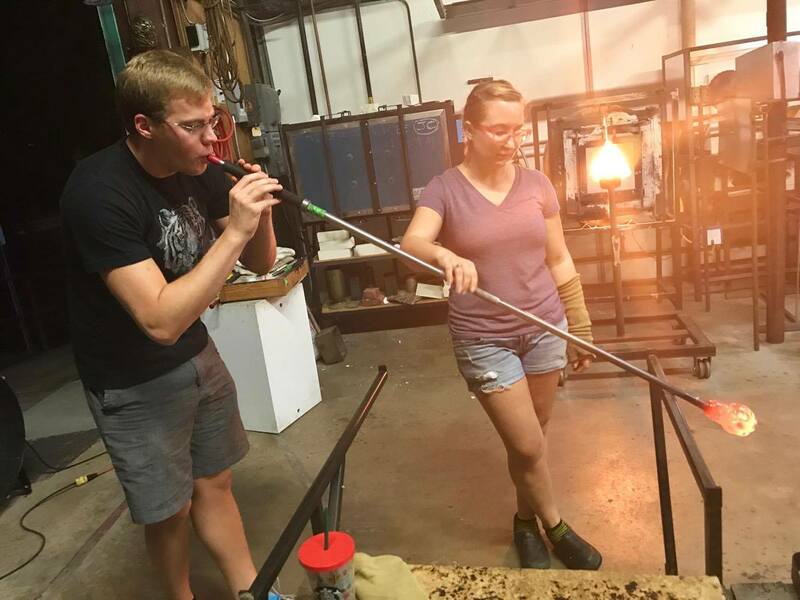 I’ve never tried glassblowing but it looks interesting. I did take a beginner’s 5-week pottery class a couple of years ago and it was really cool. PS: Your creation is adorable! In a couple of my classes in grade school, we got to make some pottery. I would love to do it again! And thank you! What a fun class! I love how your pumpkin turned out. That is absolutely one of the coolest things ever!! I would love to try that sometime. And, that you came away with a beautiful pumpkin ~ Love!! I’m so glad that I was able to do this, and I’m definitely going to do it again! I recommend you try it sometime 🙂 And thank you! I’m so happy with my pumpkin! Wow! These are so amazing! 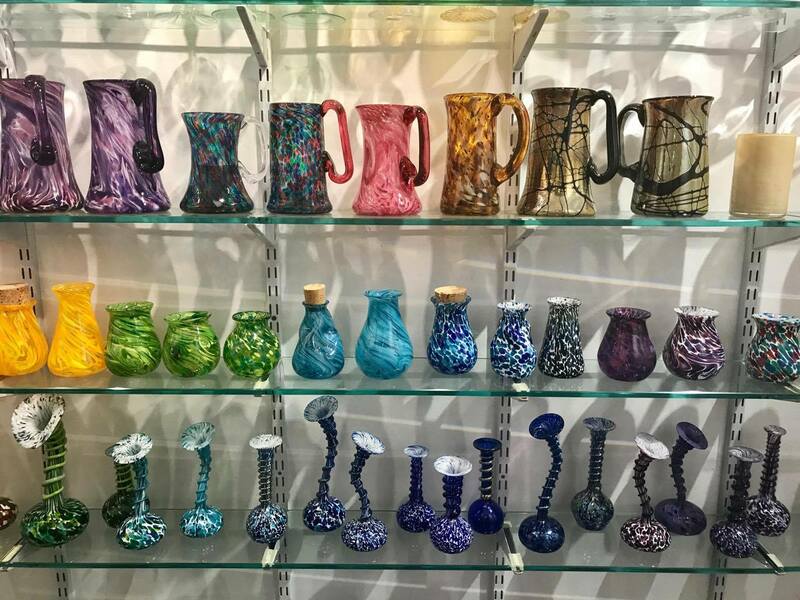 I would love to try glassblowing. They are really adorable. Aren’t they? I would love to watch them make the more intricate items! That would be super cool! 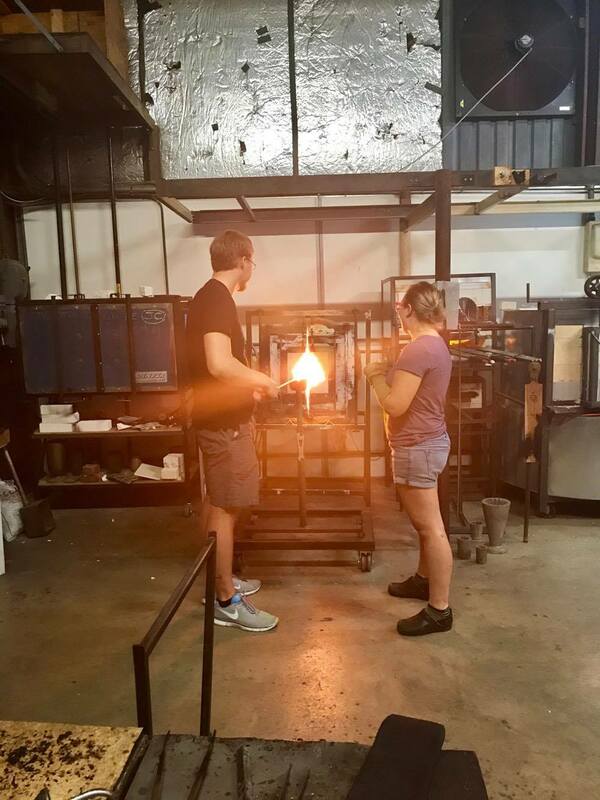 You should try glassblowing if you get a chance…it was way more fun than I was expecting! 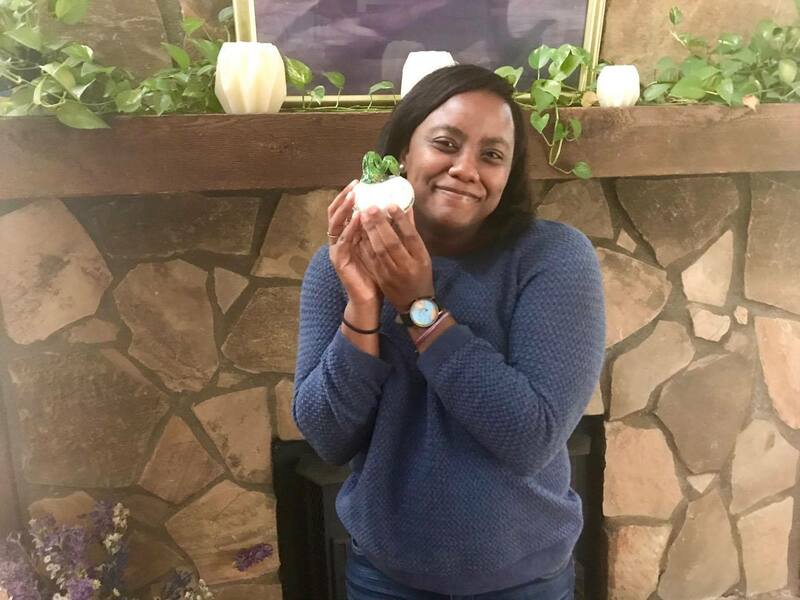 Next Next post: Feature Friday: Meet Lena D.